This article is guest posted by Mohammad Arshad. Without any ranting let me tell you my answer first .My answer to the question “Is link building through guest blogging better than comment posting” is ‘I do not know’.So then why am i giving you this article ? Because i want you to know it is still uncertain that which method is viewed as superior in the eyes of Google bots .So do not just stick with the link building through blog commenting. Try to build links through both Guest blogging and blog commenting.Most of the webmasters believe that Google is capable of finding where the link to a particular blog or website lies [whether on the article or on any other sections on a webpage].How does Google detect it ? 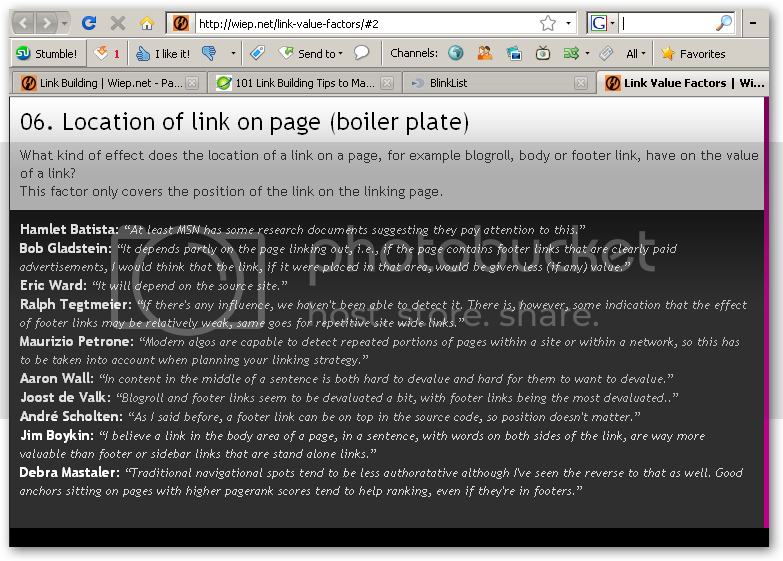 Simple.Google might see if there are surrounding texts in the links to your blog.Another way to detect the Blogroll links or the footer links would be to see which section of webpage is repeated through the entire webpages in the domain .By this way Google might come to a conclusion that the link has not been obtained through the article but either through commenting or footer links . You might all be knowing the fact that Googlers also play a vital role in tweaking the Google algorithms.I mean people working in Google dont just develop the algorithms,test them and leave them do everything on their own.Optimizing the algorithms is a continuous process.People responsible for the Google algorithm optimization would definitely be knowing every way we bloggers and SEO people try to dominate the SERP and are constantly trying to counteract them.So it makes perfect sense they might also be looking into these matters [link building through comments].So nothing can be taken for granted.My advice as i already said is to concentrate on both methods of link building.As far as my method of link building is concerned i use varied sources for my links.I use both methods discussed here .But i make sure i read the article and then give out a useful comment.So i request you to do the same on blogs on which you comment solely for the purpose of link building.There is so much to do after starting a blog and creating articles on your blog.One of the thing that you must do is link building.So make sure you spend a lot of time reading link building articles and also involve actively in link building.This is what would be deciding whether your blog lives long or dies in a short period. As you could have seen in the above screenshots, there is so much uncertainty about this topic ; so make sure you try out both methods and increase your blog authority.I would love to hear what you think about the link building methods just discussed .So please drop your comments below. I would go with building links with blog commenting if I had to choose one.It´s fast because in just a couple of minutes you can read the post and then write a relevant comment. Blog comments will get you a lot of traffic, but it will take some time. As for guest blogging, you will get a lot of visitors almost immediately after your guest post is live. Bottom line, traffic isn’t about choosing between this or this. It’s about using a synergy of everything. Great article – althoug just to let you know, there are a few of the screen shots are blurred. Mohammad – I’d be particularly interested in your comments if you had a look. Hello Jonny.Clicking on the screenshots and viewing them on a new tab would be better . it’s great question and I am really not sure which one works best. I have just started my blog about losing fat without dieting and have submited couple articles today. Also I have found blogs in my niche and commented on some great post. So I will check my blog stats in couple days and tell you which one works better. I think it depends on what you want to achieve and who you are. If you’re an affiliate and you are just starting out, you have problems with writing content, you have limited knowledge and all you want is more links then commenting is good way to start. Also depending on your comment quality you might get some traffic and even some recognition if done right. 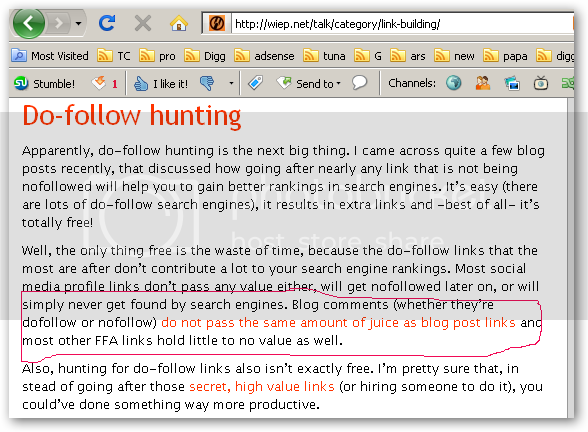 Nofollow would be the issue for the Google if you know what I mean. On the other hand – if you want to be recognized for who you are and what you do, then being a guest poster on other blogs can be VERY beneficial. It is not just about the good quality dofollow links you get, it is also about getting recognized as an expert, getting loads of eye balls to read your content and interaction with audience you wouldn’t have reached otherwise. – your post could be getting traffic from other sites that linked to you (just because the other sites decided to link to it as they follow the original blog’s author). How good is that! Priceless! I agree with Arshad that we should focus on both ways to link building, and its going to saty as long as we continue to use blog. Of course, one way link back to you is the best. But its usually quite hard to have it. 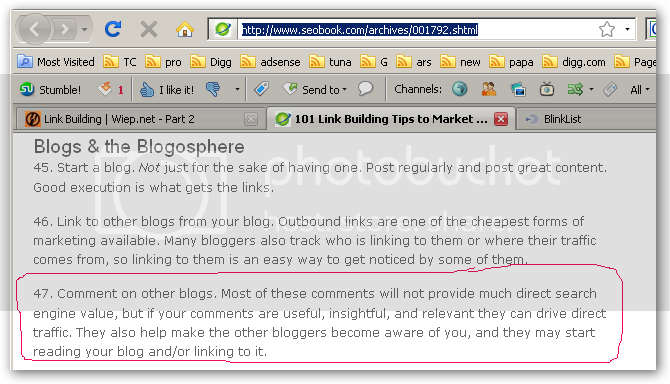 Coz i’m noob in english so i prefer to use blog commenting for my link building strategy than be a guest post. 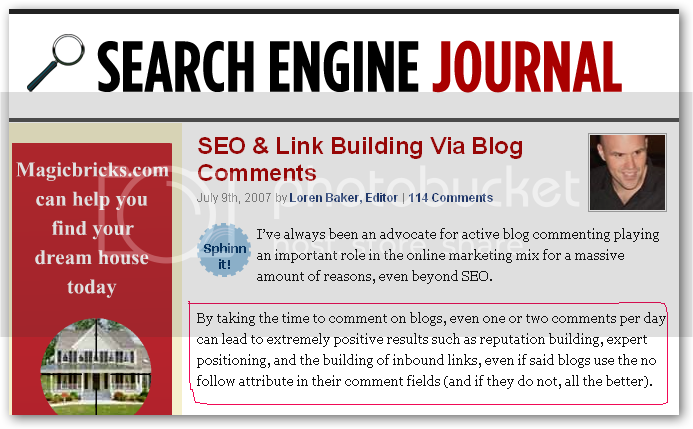 Blog commenting is useful for site wide linking. Guest posting is useful for deep linking. For sites without keyword love use a name that uses one of your keywords in the title like I’ve shown above. Blog commenting is moderated so you might lose your comment based on a whim whereas if your guest post gets rejected you can take it somewhere else.